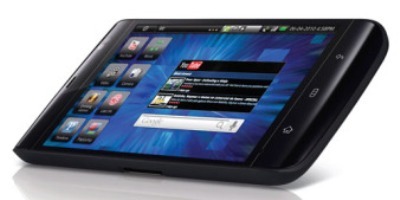 After much teasing and a European launch, the Dell Streak smartphone has finally arrived here in the U.S. The Streak goes against the gradient, with its roomy 5-inch touchscreen and a design that emphasizes its huge potential as an Android-based data device. But it also has a phone, too, and as such, stands to be judged against the latest competitors in the smartphone arena. And that’s where the Streak stumbles. After spending some quality time with the device, I found a lot to like when using it for multimedia and data. But, it’s lacking as a phone, and the overall user experience was lackluster. My experience with the Streak sums up the devices schizoid nature-is it a ginormous smartphone on steroids (not quite) or a tablet computer for your palm (closer to the mark). In the end, in spite of its unique design and appealing viability as a handheld media device, in use the Streak feels too much like last year’s Android device. The Next Step for Handheld Computing? This palm-sized gadget is truly optimized for use as a handheld. While using it, I couldn’t help but think of some of the Star Trek PADD devices, the smaller ones that unobtrusively fit in a single hand. The Streak has a sleek, contoured design black plastic and metal design, with a 5-inch Gorilla Glass display. The large screen means the Streak’s dimensions will defy many average-sized pockets-I couldn’t slip it into my jeans–but might be tucked away more readily into larger spaces, like my deep-pocketed blazer. It weighs in at 220 grams, and just 10mm thick, compared with the Apple iPhone 4’s 137 grams and 9.3mm depth (that with a 3.5-inch screen). The Streak’s specs sound appealing: 1-GHz Snapdragon processor, 512MB of RAM, 16GB of storage (on a microSD card), 800 by 480 WVGA screen (same as Nexus One and Sprint Evo 4G), GPS, GSM/HSDPA/HSUPA/UMTS/EDGE support, Bluetooth 2.1 EDR, 5-megapixel camera (with VGA front-facing camera). The specs come to a roaring stop, though, when you get to the Android load–version 1.6. In a world where all the cool Android kids are now running Android 2.0 or 2.1, the Streak suffers from the burden of 1.6. The device often felt surprisingly, unexpectedly sluggish to navigate around; given the Snapdragon processor inside, it’s easy to point to the Android OS as being the culprit (later versions of Android are far zippier). To its credit, Dell has tweaked the OS to enhance some menus and displays to make them easier to use and complement the Streak’s horizontal-friendly design. The company has also integrated some capabilities of later Androids into the Streak-including Exchange support (with Touchdown integration), multi-touch (though, in testing, only in some applications), and support for Google Maps with Navigation. Dell also adds integrated Windows DRM support, for loading the device with protected content. And Dell says it will update the Streak to 2.2, a move which will hopefully help address the responsiveness issue. But at launch, at least, the device feels stale. The Streak feels surprisingly natural to hold in one hand, or to hold between both. My small hands had a bit of difficulty spanning the device’s horizontal keyboard, but colleagues with larger hands had no issue there. The keyboard feels a bit cramped; I found I typed best on it by laying the tablet down. As comfy as single-handed use was for reading or holding it as a phone (albeit a bulky phone, but more on that later), everything about the Streak is actually optimized for use horizontally. Physically, the Streak has few buttons. At the right are the home, menu, and back soft-touch buttons, all oriented for horizontal use. Along the top is the headphone jack, volume rocker, power, and camera buttons. Annoyingly, the volume buttons change function depending upon the unit’s orientation (whereby up and down reverse, and not in a logical manner). Given the device’s physical layout, it makes sense that Dell has tweaked the Android OS for horizontal use, too. But not always for the better. The display is optimized for use in horizontal mode; you’ll swipe left-right to maneuver among the four home screens. The first screen has an e-mail widget; the getting started guide, plus browser, maps, phone, and Market icons, and Google Search toolbar, the third contacts, messaging, and Gmail apps, the fourth a kludgy Facebook widget (shows your wall and lets you update status, but shunts you to the Web to actually respond to anything), and camera, YouTube, Amazon MP3 Store, and music player apps. The notifications bar runs along the top of the horizontal display; you can also reach notifications via the menu button. But you have to hunt to find the app Launcher tab. Here, the Streak fails to capitalize on the roomy screen, with tiny, hard to navigate icons instead of a layout that takes advantage of the screen. The same could be said for some apps I downloaded. Several current games I installed would only display in vertical mode, and wouldn’t scale to the large screen. Other apps, like the eBay app and Kindle app, looked lovely on the large screen. Plugged into the PC, the Streak gave me the option to copy media files to and from my PC, copy other files to/from my PC, or charge only. After selecting copying media files, I went to work filling the Streak’s microSD card with content. Dragging and dropping music worked smoothly, but not images. I tried to copy some JPEG images from my hard drive to the device, and Windows gave me an alert saying the images had “one or more properties outside of the device’s limits”, and suggested using a media program to convert the file before copying it. The screen certainly is fit for playing back video, and doing so was easy-I simply copied some files over to the 16GB microSD card, and sat back to enjoy. Ditto for viewing photos (one of the apps multitouch worked in). The YouTube playback, though, underscored the screen’s lack of resolution; by comparison to the iPhone 4, the same high-quality video streamed via Wi-Fi showed a distinct lack of detail and poorer colour. While video, at least compared with iPhone 4, felt lackluster, the photo viewer provided a pleasing experience. I loved how the photo viewer allowed me to cycle through images; and, how pinch and zoom into photos, and it showed the per cent as I zoom into the image. Oddly, when I tried to drag-and-drop photos to the device, Windows warned me that it might not be able to read the images without reformatting (the Streak had no trouble, though). That wasn’t the only glitch I encountered. The Streak’s camera often had difficulty focusing, and was very slow at shooting; sometimes, the shutter button didn’t work at all. The camera had a moderate selection of options, but let’s just say I wouldn’t try to capture something that wasn’t stationary with this camera. With all of the Streak’s multifunctional assets, it’s easy to forget that it makes calls, too. Here, perhaps, was the greatest stumble of all-the earpiece’s audio sounded muffled, and the audio quality was no better over the tinny, limp-sounding built-in speaker. The speaker is on the back of the device, so you can’t have the Streak resting on a surface if you want to use the speakerphone (or listen to music/video). The phone app does work in horizontal and vertical modes. The visual face for the phone app lacks the flair of other Android phones.The phone felt fairly comfortable to hold up to my face, though, in spite of its large size. In the end, I often found myself comparing the Streak to the smaller-sized e-readers I’ve taken for a spin; and there, the Streak of course compares quite favorably. Yes, the cost will be higher for this LCD based tablet than for those pint-sized E-Ink devices, but the Streak is a multipurpose entertainment device that also happens to excel as an Android e-reader. I used the Kindle for Android app, and found the Streak’s size and display highly conducive for reading, almost like curling up with an old-fashioned paperback (only two hands were not required). I also found myself comparing the Streak to handheld entertainment devices I’ve used before, such as those from Archos. Here, the Streak stands out as well, due to its compact size and versatility. It’s when I consider the Streak as a smartphone that it feels less worthy; its audio quality is mediocre, and it lacks the visual and interface polish of competing devices. I suspect part of the Streak’s definition will come based on how it will be sold and marketed. And part of it will depend upon the final price. Rumor mills have pegged the price at $500 for an unlocked device; we’ll update this review and give a full rating once we have all of the details from Dell.